Chairde means friends in Irish. Cindy and Joanne have been friends since .... well, for a very long time, let's put it that way. They met in college while working in the theatre. After college, though they periodically stayed in touch, they wandered their separate paths. Cindy's lead her to a successful career in IT. Joanne got married, had two children, and works in public relations and marketing. Cindy had stayed involved with the Irish theatre company founded by their professor from college. She recommended the professor reach out to Joanne and her husband for a part in an upcoming show. That led Joanne to other parts and more involvement with the theatre - and renewed the friendship. Both ladies enjoyed a number of hobby's. Among Cindy's favorites were cross stitching and cooking. Joanne loved gardening, cooking, and herb studies. During an evening of "Catch Up Crafting" (getting together to try to complete some of those half started craft projects), Joanne showed Cindy some lip balm and lotion bars she had made. One thing lead to another and soon there was more balms, butters, and lotion bars than the two could give away. They decided to sell some at a local craft fair. The response was fabulous, and the idea for a new business with two friends was born. Joanne's grandmother was 100% Irish, and she was a big influence on Joanne. Cindy's grandmother was a Maley, also of Irish decent. Through those connections and visits to the Emerald Isle, the Irish theatre company they were part of, and the fact that the Irish are just fun people, the two had a great fondness for all thing Celtic. So it was only natural that they create that Irish connection with their new company. Celtic - for all things Irish and of Celtic association. Chairde - because it means friends in Irish. Creations for all the fabulous things they create! 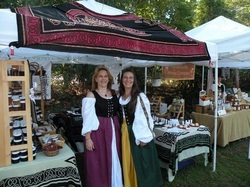 Both ladies hand make all of Celtic Chairde Creations products from original recipes with raw materials. As many of the ingredients as possible are locally grown and sourced. They personally small batch process all of the lip balms, sugar scrubs, lotion bars, and other skin care and bath treats. When a new idea comes up, each ingredient is carefully researched and selected for the positive properties it can add to the final product. It also makes it easier to create new products that customers may be looking for. Plus - it's fun! When friends get together to create - magic happens! Ar dóigh rud a tharlóidh!